Though home to Facebook and the people that created it, Menlo Park should actually be considered a Bay Area retreat. Enjoying 255 sunny days each year, and an 84 out of 100 on the Sperling Comfort Index, rest and relaxation is an everyday experience. In this Silicon Valley suburb, precipitation is not the drawback. 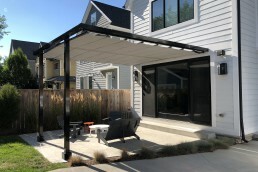 Instead, some reprieve from the sun with complete shade protection is of utmost importance. 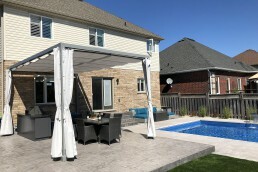 Especially when homeowners have every intention to host and entertain guests in their beautiful poolside oasis. 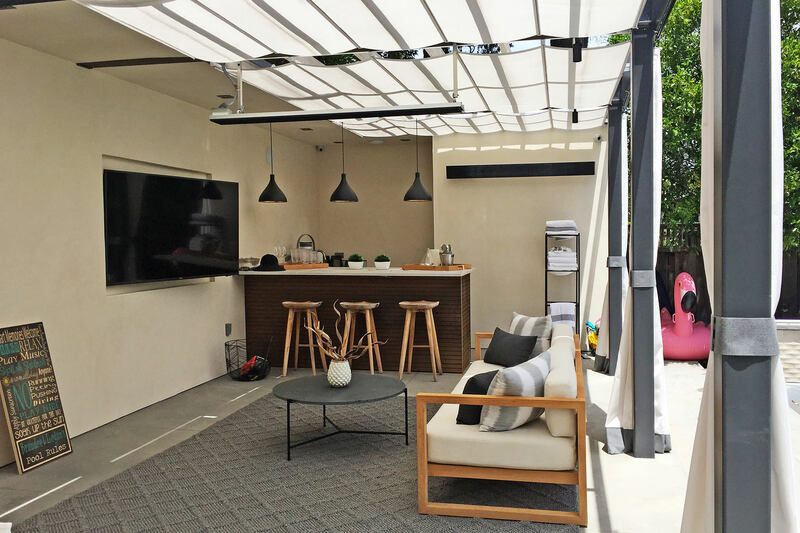 Working with Hawk Building Company of the Bay Area, and Shades of Green Landscape Architecture, we helped create an outdoor space that would ensure maximum comfort and utilization, but also maintain beauty and elegance for one Menlo Park resident. 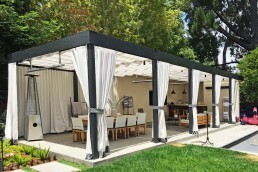 Covering almost 500 sq.ft, the pergola covered space is fitted with a bar, overhead heaters and lights, as well as perimeter curtains to block wind and sun. 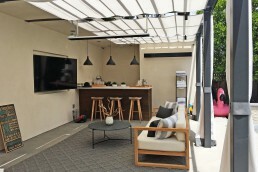 This particular space brings all the comforts of their home, outside. 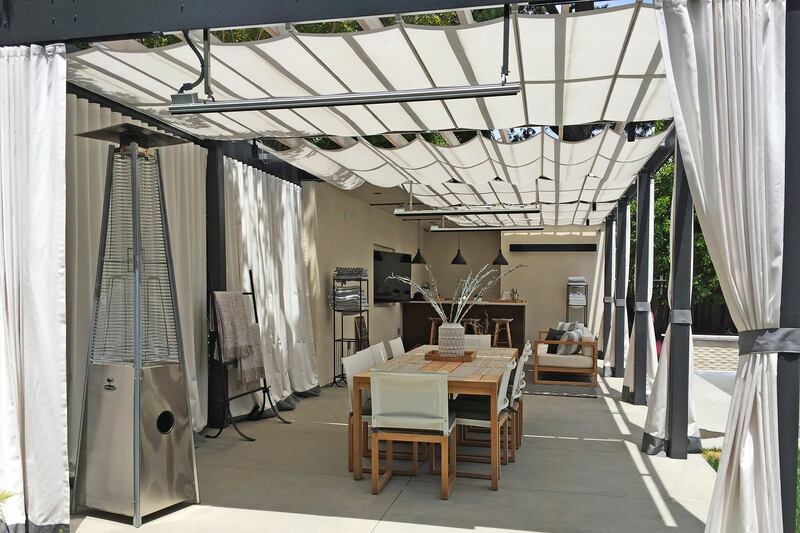 To complement the design, utility and comfort of the space, we installed five motorized ShadeFX canopies without disturbing any of the spaces design requirements. 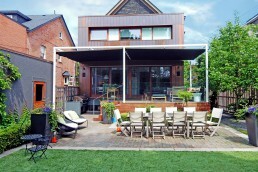 Through steady dialogue, collaboration and a shared vision, we were able to provide a solution that not only pleased the homeowner but also our collaborators, Hawke Building Company and Shades of Green Landscape Architecture. Much like them, we look forward to our next project. 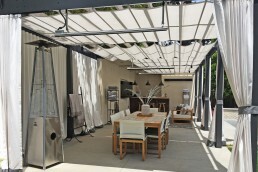 Covering almost 500 sq.ft, the pergola covered space is fitted with five retractable shades, a bar, overhead heaters and lights, as well as perimeter curtains to block wind and sun.